As reported by ICVA (referencing this ECHO Daily Flash), Tanzania "has withdrawn [from] the implementation of the Comprehensive Refugee Response Framework (CRRF), stopping the ongoing exercise to provide Tanzanian citizenship to some Burundian refugees and that it will 'discourage new asylum seekers'. Tanzania had traditionally so far had a solid reputation for welcoming refugees and was a CRRF pilot country." For updates on other countries/situations where the CRRF is being rolled out, visit the digital portal. Also available are monthly global updates (here is the most recent one, from Dec. 2017; to access, scroll to the bottom of UNHCR's CRRF web page. - Six will be held monthly in Geneva, beginning in February. More information is provided in this roadmap. - "The two days of discussions were dedicated to taking stock of progress made and lessons learned in the process leading to the global compact on refugees... ." A summary report of the 2017 Dialogue and summaries of the six thematic sessions are now available. - Follow link for report in multiple languages, written contributions from Member States and other stakeholders, video of the report launch, and background information. See also related Refugees Deeply comment. 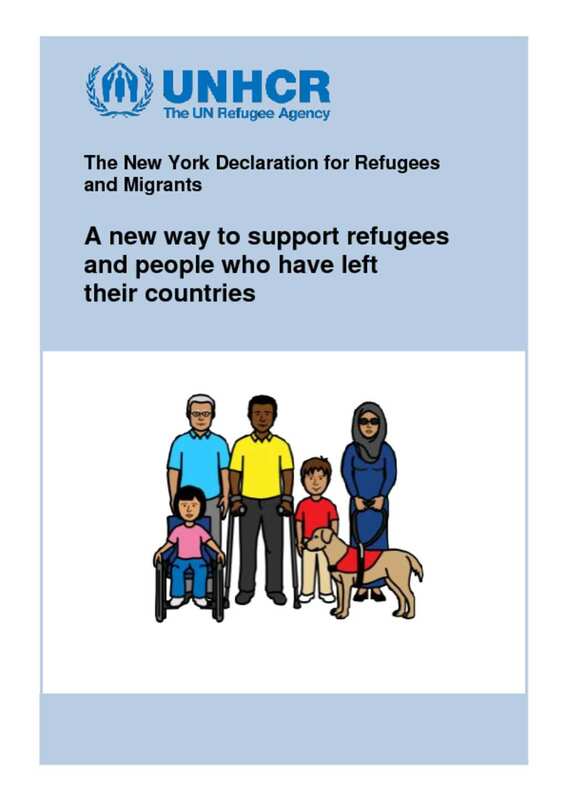 - An easy-to-read guide that "is intended to explain the NY Declaration in accessible language for anyone interested, without the need for background knowledge on topics covered in the document." - This publication consolidates the results of discussion that took place during two International Dialogue on Migration events, one in New York in April 2017 and the other in Geneva in July 2017. It "contains the report and supplementary materials of the two events. The report is organized around five themes emerged from discussions and reflects the significant convergence of views that emerged during the two dialogues. The final section brings together key recommendations made during the workshops."